Pine Island’s past is preserved for tomorrow in the collections and activities of the Museum of the Islands. Resting like bright emeralds in the warm waters of the Gulf of Mexico, Pine Island and its surrounding islets have always been a world apart from the rest of Southwest Florida. For years, the islands were accessible only by boat–and many still are today–the building of a road bridge across tiny Matlacha to the mainland has linked the modern world to the islands, but has not spoiled their unique, off-the-beaten track character. For most of its history, the area has been a rural, sparsely populated haven for fishermen and those wanting a quieter lifestyle apart from the booming tourist trade found on the mainland. The islands, while modern in most details, are still firmly rooted to their history. The Museum of the Islands was established to help document and preserve the past for the next generations of Pine Islanders and visitors. The Museum of the Islands is housed in what was once the island’s first (and only) public library, built by volunteers in the early 1960s. When the library moved to a larger facility, a new group of volunteers stepped forward to secure the building as the home of a museum about the islands, their history and lifestyle. Lee County leased the building to the museum group for $1 a year for 5 years. The Historical Society would have to renovate the building and establish their museum with their own funds – it would not be tax supported. Fundraisers and donations by generous islanders interested in preserving Pine Island’s colorful past provided funds for repairing the building. In late 1989, the museum was ready to be installed in the building. During the years prior to the formal foundation of the museum, an informal but very successful hunt for materials for exhibits had been under way. Items that had been collected and stored were ready to move into their new home. The Naples Museum contributed 6 large, lighted 8-foot high wall cases. These formed the foundation around which the museum displays would be constructed and in which historical items would be exhibited.. The St. Petersburg Museum donated a collection of antique showcases, crafted of wood and glass, whose turn-of-the-century styling lends the Museum of the Islands a decidedly Victorian atmosphere. 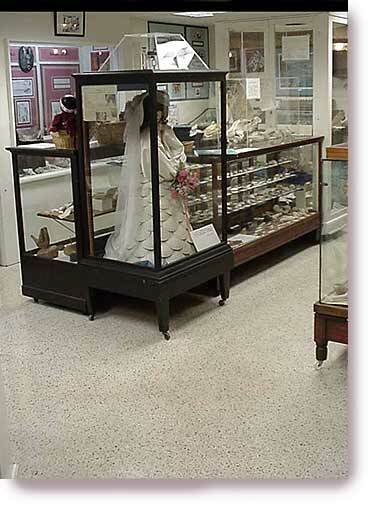 In fact, the museum has the comfortable feel of a vintage exhibit hall found in an Old World school or university. 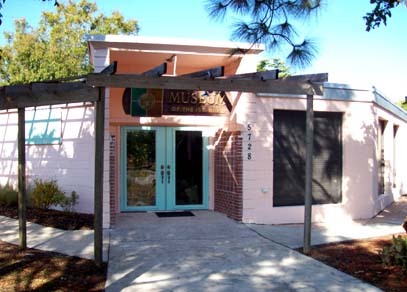 The Museum of the Islands was dedicated on Sunday, February 4, 1990, with a ribbon cutting ceremony. After five years of planning, scavenging and hard work, the museum opened its doors to the public. Since that day, the Museum of the Islands has evolved and grown as new exhibits and pieces are found or donated. And the search goes on though – there is much to find on this rural island of fishing villages and early history of its people. Today, Museum of the Islands is a major feature for visitors, tourists, winter residents and their guests as well as native Pine Islanders who love their past. Manned and developed entirely by volunteers, the museum has hosted an amazing number of visitors over the years. Our guest book shows visitors from all over the world – and many repeat visitors.